My favorite part of going on field studies with my Winterthur classmates is seeing new sides to places I thought I already knew. This year’s trip to southern New England opened my eyes to a new-to-me component of life in New England with visits to two historic sites: Touro Synagogue in Newport, Rhode Island and Vilna Shul in Boston. Elementary schools across the state talk about the Pilgrims landing at Plimoth in terms of Europeans seeking religious freedom and tolerance, but seldom do they mention the Jewish communities that also worked to keep places like Newport and Boston open and tolerant to all religions. Interior of Touro Synagogue. The light pouring in the windows around the top of the balcony illuminates the space, and the carved capitols on the columns and around the Torah ark add depth to the space and provide additional surfaces for light and shadow to play. Interestingly, Touro Synagogue is both a historic site and operating space of worship. This congregation played an active role in the restoration of the space, including choosing which of the eighteen historic paint colors would be used. They chose this seafoam green, a late 18th/early 19th century paint color, rather than the first color ever used: a deep red/brown mahogany. Image courtesy of Touro Synagogue (http://www.tourosynagogue.org/photo-galleries/touro-synagogue-gallery). 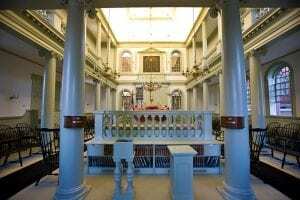 Touro Synagogue is in a building designed by Peter Harrison, Newport resident and pre-eminent architect of the 18th century. 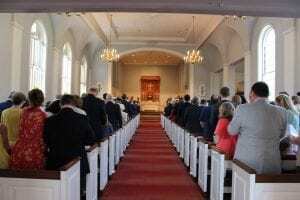 When I first approached and entered the building, I was surprised by its architectural similarities to some of the Episcopal churches I frequented growing up in the area. The Torah ark was a beautiful series of cabinets, with carved panel doors that echoed the Palladian moldings around the bottom and top of the balcony. Our guide walked us through the multi-year restoration process of the temple, from the still-active congregation choosing which of the eighteen historic layers of paint would be the right color, to installing a temperature-controlled compartment for the Torah. I was struck by how light and airy the space felt, even on a sweltering and humid August day. The interior of St. Peter’s Episcopal Church in Weston, Massachusetts. While sitting in Touro Synagogue, I was reminded of this sanctuary where I spent many Sundays with its tall, arched windows, columns, and stepped ceiling. While Touro Synagogue’s interior architecture is more dramatic than this church, I could see the similarities in architecture of southern New England places of worship. Image courtesy of St. Peter’s Church. 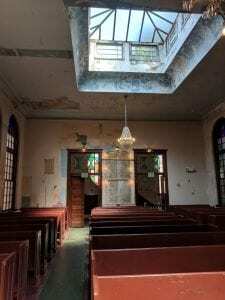 Vilna Shul, on the other hand, is the story of a congregation of Eastern European Jews who finally acquired a more permanent space to worship after the former Baptist church they were using was scheduled to be demolished in the early 20th century. Looking around the West End of Boston today, it is hard to imagine that this synagogue was one of over forty in the area less than 100 years ago. Built in 1919, it is a brick, double-fronted space with the temple itself on the second floor. After entering through the dark brown-painted doors and climbing the stairs, I was once again struck by the expansiveness and brightness of the space with its beautiful early 20th-century stained glass and added skylights. Our guide, Nancy, shared with us the story of this synagogue’s multiple uses over its 100-year history, and upcoming plans to restore the 1920s wall murals and decorations that have been covered by tan paint for decades. I was also surprised to learn that the green walkways were made of cork and had lasted since the building first opened 98 years ago! Photo taken of Vilna Shul standing next to the Bima looking towards the main entry at the front of the building. Note the green walkway, skylight, arched stained glass windows, and partially-uncovered original artwork from the 1920s. The chandeliers and pews in the space also came from the Baptist Church which this congregation used as their synagogue until they were able to build this building in 1919. Image taken by the author. Individually, Touro Synagogue and Vilna Shul share the stories of their congregations, of people seeking space to worship and form a community. Together, they reveal the richer history of southern New England: the stories of Jews and Christians living harmoniously, whether in the Golden Age of Newport mercantile culture or in the immigration explosion of Boston’s West End in the early 20th century. What’s more, they offer a way to connect with future generations in a world where children are not brought to worship every week: when asked to provide a unique identifier for his character on Star Trek, West End-born Leonard Nimoy chose to modify the Priestly Blessing he knew from his devout orthodox Judaism. “Live Long and Prosper” took an ancient belief system and made it popular in a new way, further carrying the significance of the New England Jewish communities into the future. 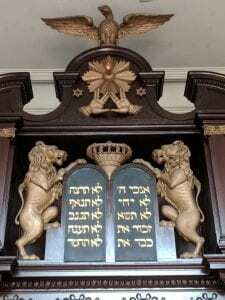 Close-up of the Torah ark showing the Priestly Blessing. Familiar to non-Jews of the 20th century, this is the symbol that inspired Leonard Nimoy to use the hand symbol and associated phrase, “Live Long and Prosper” as a defining component of his character on Star Trek. Image taken by the author.